This time of year, many kayakers are hanging up their paddles and life vests and resigning themselves to a hibernation season of trip-planning and wistful memories of on-the-water touring. The truth is the fall-through-early-spring stretch of the calendar can be a fabulous time to paddle, with full flows, ice-glazed scenery, and quieter waterways. A sturdy saying you’ll come across frequently on this subject (as in winter camping or rainy-season adventuring) is, “There’s no such thing as bad weather—only the wrong kind of gear.” If you’re protecting yourself from the cold and the elements, there’s no reason you can’t enjoy top-quality paddling during the “off-season.” And it’s worth emphasizing that cold—cold water, cold wind—is a fixture (and a risk) of many sunny, summertime kayaking forays as well. Let’s take a look at some of the basic elements of off-season paddling! “The wrong kind of gear” won’t stack up to the rigors of the weather and the chilly depths of fall and winter. At best, you’ll be uncomfortable and miserable; at worst, you’ll be in a life-threatening situation in a hurry. Hypothermia is a risk for paddlers year-round, but obviously, it’s cranked up when both water and air temperatures plunge. Immersed in water temperatures in the 30s (Fahrenheit), you may have 15 or 30 minutes to play around with. Besides hypothermia itself, plunging into a winter river or lake can also induce cold shock, an immediate, involuntary hyperventilation-like response to the sudden frigidity that can cause you to gulp in water. And of course, you don’t need to actually take a dunk to suffer the perils of cold. Paddling while soaked through with sweat and spray, or simply exposed to chilly air (and a chilly hull) without proper protection, can initiate hypothermia. And among that condition’s symptoms are impaired cognition and motor function, which means you may have difficulty responding to hazards, making rational decisions (such as judging when to head in), and executing basic maneuvers. As with any kayaking, it’s critical to master basic safety skills and procedures before you tackle a cold-water trip. Perfecting that all-important roll and learning how to perform a rescue are best done under ideal (and warm) conditions. The stakes of safely dealing with a capsize with insufficient practice are raised considerably in cold weather. Recreating amid winter’s chill and fickleness demands a carefully considered wardrobe, and needless to say, cold-water paddling’s no different. What winter kayaking clothing you wear depends on a number of factors, among the most fundamental of which is your skill level. 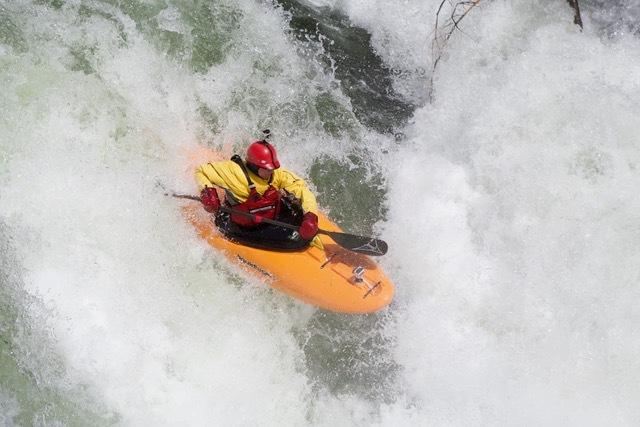 Advanced kayakers may choose to go lighter in terms of insulating and water-resistant outerwear because they’re confident in their ability to roll out of trouble and avoid the full-on immersion of a wet-exit. Novice and intermediate paddlers—and plenty of stone-cold experts, too—should suit up for the worst-case scenario. When kayaking in water temperatures in the 50s or lower (and even warmer, depending on your relative “cold-bloodedness” and personal preferences), you’ll probably be deciding between a wetsuit, a drysuit, or some combination thereof. A neoprene wetsuit keeps you warm by installing a layer of water next to your skin: a liquid buffer warmed by your body heat that then insulates you from the cold. A wetsuit is basically a kind of a base layer; you can wear other layers over it for added warmth (often necessary, given a dry wetsuit isn’t offering much in the way of insulation). As the names suggest, a drysuit has a fundamentally different design than a wetsuit: namely, its aim is to completely prevent water from getting inside. Made of waterproof materials such as coated nylon or Gore-Tex, drysuits have rubber gaskets at their wrists and neck to seal those openings. 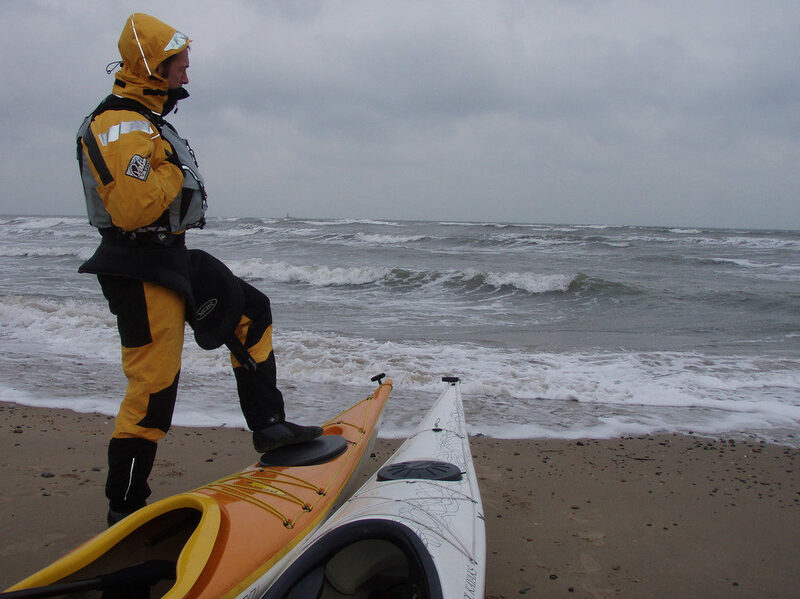 A drysuit serves as the “shell” of a classic layering system. Beneath it you can wear a wicking base layer of synthetics or merino wool and, if necessary, a fleece or wool insulating midlayer over that. Thin layers—and often simply one layer of long underwear or a fleece liner—are best beneath a drysuit, as it’s easy to overheat despite its breathability. Another excellent option is the drytop, basically a drysuit upper that can be worn over the classic wetsuit overalls (“Farmers Johns”); drypants can provide lower-body protection as well. Such combos are good alternatives to a full drysuit, which nonetheless is the go-to choice for truly frigid or rough conditions. If you’re easing your way into cold-weather paddling with some shoulder-season outings or trips in southern climes, you may want to start with a Farmer John wetsuit: significantly cheaper than a drysuit. For the most versatile and secure off-season kayaking, though, you’re likely going to end up in drysuit (or at least drytop) territory. Again, very experienced kayakers may take winter trips suited merely in a wool sweater and paddling jacket. Neoprene gloves or the special neoprene or nylon mitts called pogies protect your hands, while rubber-soled neoprene booties, preferably of the high-top variety, seal off your feet. As Bryan Hansel notes in this Paddling Light treatment of winter kayaking, a seat guard and heel pads don’t just improve your comfort level: They also provide further insulation from a water-chilled hull on a cold-weather paddle. And of course don’t forget your life vest, which besides its importance in a survival situation also wards against the dangerous water-gulping response of cold shock. It’s also a good idea to have a thermos of hot water in your kayak, your basic emergency kit (including fire-starting tools and materials), and a change of clothes in your drybag. The summer paddling season may be over, but a whole new season is just getting underway! Suit up properly, take the responsible safety precautions, and get out and enjoy the wintertime waterways! This entry was posted in Recreation and tagged cold weather, kayaking, sports, winter by Kelli Martinelli. Bookmark the permalink.